The talk of Davos this year was about the people who were not there – Donald Trump, Theresa May and President Mnangagwa of Zimbabwe. But 3000 other people made it to the ski resort in the Swiss Alps, including 1500 from the private sector (who pay an average £21,000 each to register), 500 of the world’s media, 300 policymakers and a mix of NGOs and academics. Together with Professor Sir Charles Godfray and Professor Sarah Whatmore I was invited to take part in an Ideas Lab organised by the Oxford Martin School on ‘Future-proofing the Food System’. It was the most terrifying presentation of my life with a super-strict Pecha Kucha format for the talk (no, I didn’t know what that was either till a few months ago). In essence, a five-minute talk presented in the manner of a stand-up comedian (without jokes), with 15 slides, each lasting exactly 20 seconds and run on an automatic timer – absolutely no room for error, no scope to trip over a word, or ad lib with a topical reference, or the slides would run away without you. Seriously anxiety inducing for all of us. But we pulled it off in some style I think and the subsequent group work created an amazing buzz of discussion. It was helped by having a packed room of people with an amazing range of knowledge and experience, including the Minister of Health from the UAE, Head of Global Agriculture for the World Bank, Vice-Chairman of PepsiCo and the Chief Executive of the Kofi Anan Foundation. We each participated in a couple of other sessions – for me a Science Hub on dietary interventions and as a facilitator in discussions about the EAT-Lancet Commission report on sustainable diets and our own report on Alternative Proteins. One of the main themes of the meeting this year was sustainability - including climate change, conservation (with David Attenborough receiving a special award) and signs of a growing interest in the importance of food production and consumption to this agenda. There was also lots of discussion about mental health – prominently led by the Duke of Cambridge. Most interesting for me was The Friendship Bench, an evidence-based intervention set up by one of only ten psychiatrists in Zimbabwe (serving a population of 13 million) to improve well-being and quality-of-life through the use of problem-solving therapy delivered by trained lay health workers (The Friendship Bench - Zimbabwe). But probably the dominant element of the meeting was artificial intelligence and big data in all its forms. 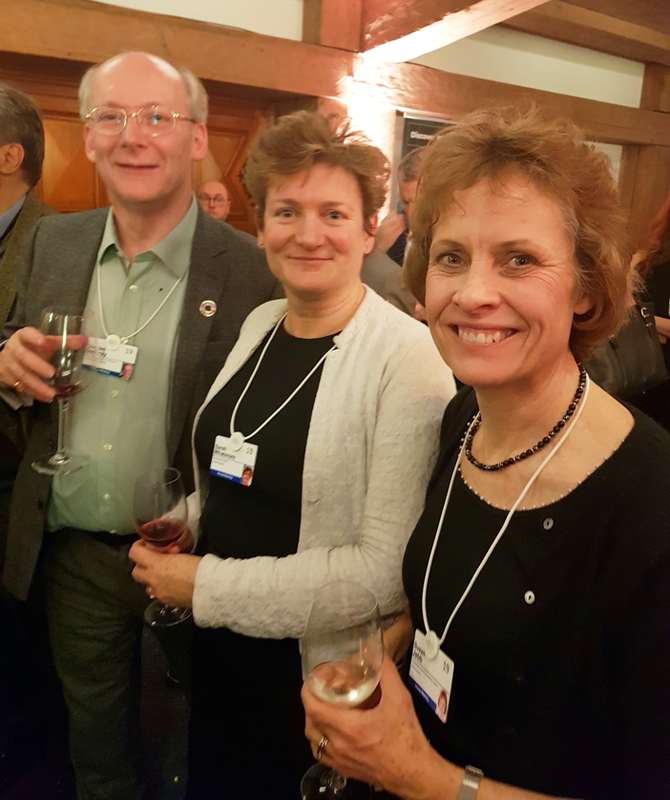 Left to right - Professor Sir Charles Godfrey, Professor Sarah Whatmore and Professor Susan Jebb at the World Economic Forum's University of Oxford nightcap event. Davos is quite a big town, but there were no shops. Outside the Congress Centre the high street had been completely taken over by corporates, who rent their premises for the week and spend the preceding fortnight transforming them into their headquarters for the week, hosting receptions, presumably having important meetings and providing hospitality to Davos participants more generally. It’s rather like the Edinburgh Fringe with an energy and buzz that goes well beyond the main event. The Promenade, as it’s known, comes into its own at night with a series of receptions and dinners – we peaked at four in one evening, concluding with the University of Oxford nightcap event, held from 10pm to midnight, with a mix of the university delegates, alumni and other guests. What will I remember next time I’m organising a meeting? If you want a large meeting to run well call in the Swiss Army – the traffic management system was incredible – from shuttle buses running every minute or two around the various locations to private helicopters landing and taking off all day long, and they organised the intense security with incredible politeness and efficiency. People were there to network – at every opportunity people were talking to each other. I collected a lot of business cards. But I am an amateur at this and need to get better at striking up conversations and following up afterwards. There are better ways to engage people in a discussion than our often didactic, powerpoint-heavy academic conferences. There was a great variety of formats across the meeting which helped keep the energy levels high - films, interviews, debates and of course – Pecha Kucha!